This Web Site is maintained primarily as a service to our membership, although the general public is welcome to visit. The documents comprising this site are made available by the I.A.T.S.E. 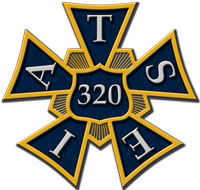 Local 320 as a part of its ongoing commitment to provide information to our members, as well as to the entertainment industry community. Local 320 does not evaluate the substantive accuracy of materials created by persons beyond its control or supervision. Therefore, although this site links to many additional web sites, Local 320 is not responsible for the materials contained within those web sites. Neither the service provider, Local 320, nor the Webmaster make any warranties expressed or implied that access to Local 320 Web Site will be uninterrupted or free from error, or that any result or information will be obtained. No oral advice or written information given by Local 320, its employees or agents shall create a warranty nor shall any user rely on such information or advice. Under no circumstances shall Local 320 be liable for any damages that result from the use of this Web Site. Operation carries certain inherent risks since the Webmaster cannot control all aspects of this site. By visiting, you agree to indemnify the Webmaster, the Local 320 and the service provider for any damages, costs, expenses, including reasonable attorney's fees that accrue as a result of or arising out of your activities on the I.A.T.S.E. Local 320 Web site.